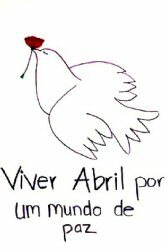 Foreword: On 25 April 1974 Portugal's Carnation Revolution [Revolução dos Cravos] overthrew the dictatorship begun in 1933 by António Salazar. 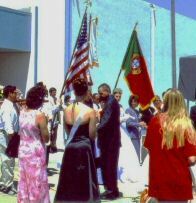 In April 2004 Álamo Oliveira was among the dignitaries invited by the University of California-Berkeley's Portuguese Studies Program to a 30th anniversary celebration co-sponsored by the Luso-American Education Foundation [LAEF] in conjunction with its 28th annual conference, by the Luso-American Development Foundation [FLAD] and by the Azores' Direcção Regional das Comunidades [DRC]; special guests included California high school students enrolled in Portuguese classes. The magazine Mundo Português reported in depth on Cal's festivities (excerpts and photos immediately below). 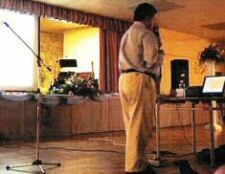 In late April 2004 Álamo joined eight other members of an Azorean government delegation on its Encontro da Açorianidade [Meeting the Azorean Way of Life], a whirlwind tour of Portuguese-American communities in Artesia, San Diego, Tulare, Sacramento, Turlock and San Jose, California. 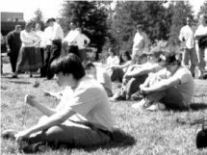 At the bottom of this page are photos of Tulare's festa and two poems by Álamo honoring April 25th. 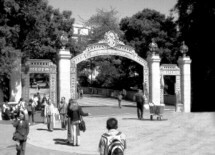 Sather Gate, iconic south entrance to the University of California-Berkeley campus, and its bridge spanning Strawberry Creek. 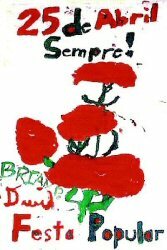 Young Portuguese-Americans held red carnations, emblematic of the April 25th Carnation revolution [Revolução dos Cravos]. Panel on Creative Arts Before and Since April 25, 1974: Álamo Oliveira, Manuel Freire, coordinator of Cal's Portuguese Studies Program Deolinda Adão, Pepetela and Fernando Matos Silva. Author and educator Diniz Borges, of Tulare, addressed the audience. 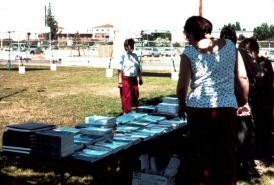 The 30th anniversary commemoration of April 25th, held in conjunction with the Luso-American Education Foundation's 28th Conference on Portuguese Language and Culture [2-3 April 2004], brought to Berkeley high school students enrolled in Portuguese language courses in California, as well as men of April and intellectuals who over the course of a weekend recalled what had transpired 30 years ago and the consequences for Portugal and its diaspora. Among the prominent names were Colonel Vítor Alves, one of the captains of April; Manuel Freire, a troubador of the revolution; filmmaker Fernando Matos Silva, who captured the revolution live; Angolan writer Pepetela; and, poet Álamo Oliveira. The talks began with the Youth Conference and an evocation of April 25th by Vítor Alves (one of three officers responsible for the movimento dos capitães), speaking in English about the revolution's causes, the colonial war, events of the day and the victories of April. Concerning the colonial war in Africa Vítor Alves told the crowd, comprising primarily young people, that it represented for Portugal an effort nine times greater than what the United States put into Vietnam, taking into account the proportionate differences between the US and Portugal, by way of explaining the financial toll on Portugal and the discontent that would lead its populace to revolution. 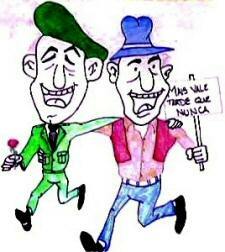 To the Azores – since the majority of the young people were of Azorean descent – Vítor Alves said April 25th brought another type of liberty as well: autonomy. "Today we live in a modern nation," he said. "Making it better depends on you. And if you do it, you will make our dream come true, the dream of the capitães of April." For adult attendees, the 28th Conference provided engrossing workshops with guests renowned in their respective areas, who were received appreciatively at this year’s event. In Creative Arts Before and Since April 25, 1974, a panel including Álamo Oliveira, Manuel Freire, Pepetela and Fernando Matos Silva spoke of their experiences before and after April and of the ways the dictatorship, especially censorship, affected their artistic careers and professional lives. US scholars and California professionals involved in Portuguese studies and the community also participated in the conference and commemorations: Deolinda Adão, Don Warrin, Manuel Bettencourt, Diniz Borges, Father Manuel Sousa, Joann Malta-Weingard, Elmano Costa, Marília Wiget, José do Couto Rodrigues, Manuela Ávila Silveira and Duarte Silva, among others. 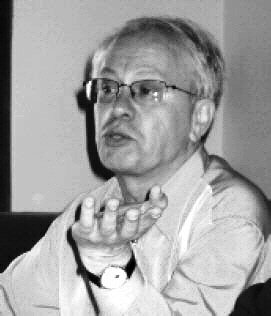 To illustrate the extent of the neutering of artistic and literary expression imposed by censorship, Álamo Oliveira cited examples of some of his works that were cut, as did filmmaker Fernando Matos Silva, whose full-length feature O Mal Amado  – a movie about the colonial war that, curiously, foretold a revolution like April's – was banned. Manuel Freire and Pepetela also spoke of censorship and the bribes they had to pay to get their work into public. Musician Freire noted a ludicrous case of censorship imposed upon a piece composed and sung by Brazilian superstar Elis Regina titled Upa neguinho, which Portugal's censors took as a reference to the União do Povo Angolano independence movement (forerunner of the National Front for the Liberation of Angola). And Freire recalled the censorship against an all-star lineup for the 29 March 1974 show at Lisbon’s Coliseum. As for Pepetela, he spoke of the difficulties in publishing African authors, at that time possible only through the use of old-fashioned stencil duplicating machines. A fascinating moment came with the screening of the earliest footage shot on 25 April 1974 by filmmaker Fernando Matos Silva, the first person to go out into the streets with a movie camera and the one responsible for the historic images most seen on television. Today these images constitute part of an historic and cultural patrimony for all Portuguese (and for the world), so the sensation of seeing them with the person who took them 30 years before, and of hearing from his own lips the circumstances under which they were shot, can only be described as another historic moment on a personal level. Colonel Vítor Alves and Dr. Alexandre Quintanilha participated in the workshop The Political and Social Project of April 25th. Vítor Alves recounted the history leading up to April 25th, and explained what he characterized as "the phases of revolution: romanticization, anarchization and institutionalization." He spoke of democracy and the victories that April brought, but did not hesitate to warn that "democracy is a very fragile flower that needs to be watered continually." Scientist Alexandre Quintanilha recalled that, just like his father, he himself was one of the victims of the dictatorship, expelled by Salazar from the University of Coimbra, harassed by the PIDE [Polícia Internacional e de Defesa do Estado] and exiled in Berlin. He then noted the enormous progress made in the scientific field since April 25th – citing, for example, over 2,000 laboratories that have come into existence in Portugal, new approaches in the research domain and a Life Sciences Program already being copied by other European Union countries. All the same, he warned, "It’s not easy to recover from five centuries of backwardness in 30 years." 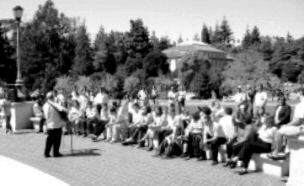 Celebrating April 25th in Berkeley: A very special significance. Álamo Oliveira – a Terceiran poet linked to California by family ties, cultural affinities and shared experiences (his novel I No Longer Like Chocolates has as its scenario the city of Tulare and the dramas of a family of Azorean immigrants) – told Mundo Português about the feelings he experienced in coming to Berkeley to celebrate April 25th. AO: The very fact of being here raises two interesting issues: first, this undertaking transfers the celebration of freedom's essence to a city and to a university that have freedom of expression as their strongest point, and that honor within this place the highest truth as almost a kind of mantra; and the other, that I was one of the people who benefited the most from April 25th. I ceased, or more accurately we all ceased, fearing or being afraid to speak – although in the process we may also have lost another art form, that of saying things through words that would have to be interpreted and read between the lines. In any case, what I think is most important is that, with April, the Portuguese people finally gained their rights to freedom of expression and to live under democracy. That’s what was most important. MP: Was your literary creativity hurt greatly by censorship? AO: Yes, I had several works censored. Back then I was not publishing as much as I do today... By the way, my first book is from 1972 [two years before the fall of the dictatorship]. In Angra do Heroísmo [Terceira, Azores, where I live], censorship never exactly had a visible face, so to speak. Censorship only manifested itself because the newspapers were censored daily and sometimes blank spaces appeared in them. But I had many things censored and banned among theater texts, which were so cut to ribbons that they couldn’t be performed properly, because they had lost their meaning. NEW! Historic film clips from 25 April 1974: Arrival of Gen. António Spínola at Lisbon's Quartel do Carmo (government and secret police command post, where dictator Marcelo Caetano took refuge); Capt. Salgueiro Maia addressing the crowd. Carnation Revolution leader Col. Vítor Alves, addressed students on Portugal's colonial war and the victories of April. Cal has archived his oral history of these events. 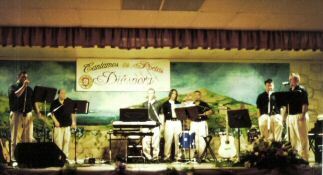 Tulare Union High School's grupo folclórico performed Azorean folk dances. 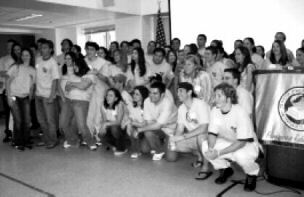 High school students of Portuguese who participated in the April 25th commemoration at Cal. Manuel Freire serenaded the crowd with three famous songs of April: Livre (Não há machado que corte), Pedra Filosofal – and Grândola, Vila Morena, whose airing by Rádio Renascença just after midnight on April 25, 1974, signaled the start the Carnation Revolution (see timeline; leia mais). View also a music video compilation of famous images from April 25th. 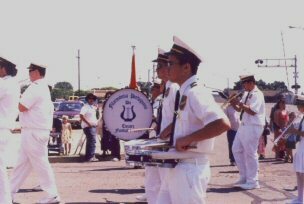 Each year the Filarmónica Portuguesa de Tulare leads the festa parade from St. Aloysius Church to the T.D.E.S. grounds. In memoriam, President Heduíno Brasil and Secretary Manuel Silva, 6 Dec 2004. Diniz Borges (c.) checks over last-minute details with festa royalty and visiting dignitaries before the opening ceremonies. Alzira Serpa Silva (r.), then-head of the Azores' Direcção Regional das Comunidades and leader of 2004's visiting government delegation, poses with the festa's big and little queens and kings. Press secretary Fernando Vieira sent back tour photos and news releases. A young girl and her family wait in line at the dining hall for traditional sopas lunch. "Saúde!" 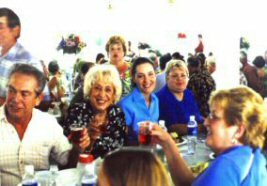 Guests at the sopas luncheon, including Tony Pires (l.) and Carol Fredericks (r.), raise their glasses in a toast, as Luísa Pacheco (c., back) looks on. 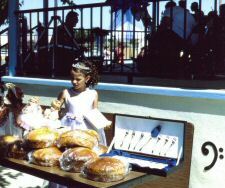 One of the "Little Queens" of the festa admires dolls in fancy costumes. In front: round loaves of massa sovada (soft, sweet Portuguese egg bread).  A book sales table offers a selection of Luso-American and Azorean literature, including Álamo Oliveira's Já não gosto de chocolates. 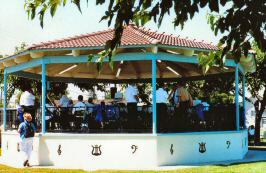 The bandstand on the T.D.E.S. 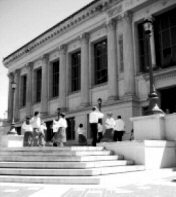 grounds shaded the Filarmónica Portuguesa de Tulare as they play pre- and post-lunchtime concerts of Portuguese music. Marcolino Candeias, part of the visiting delegation, gave an illustrated talk on the Azores' architectural patrimony; other guest speakers were Álamo Oliveira and Augusto Elavai. Alzira Silva and Diniz Borges emceed. São Miguel's André Jorge, a finalist on Operação Triunfo (Portugal's version of American Idol), wowed the crowd. 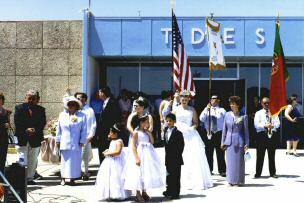 The popular local ensemble Grupo Diáspora treated the large turnout in the T.D.E.S. auditorium that afternoon to a set of authentic Azorean musical numbers. Left-right: Matthew Lawrence, Benjamim Cabral, Mário Capote, Kevin Meneses, Tony Nunes, Sérgio Cardoso and Geoff Schulz. 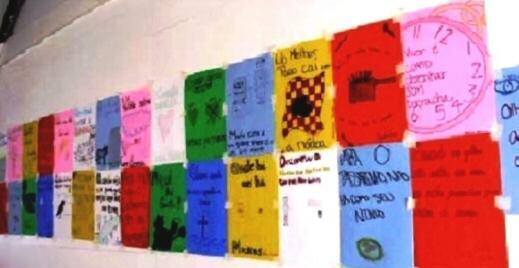 Student-designed posters (below, and at top) honoring the 30th anniversary of Portugal's Carnation Revolution were displayed on the walls inside the T.D.E.S. dining hall. Two poems by Álamo Oliveira commemorating the Carnation Revolution, originally published in other volumes, were reprinted in 25 de Abril - Uma aventura para a democracia - Textos Literários, an anthology of selected poetry and prose from 26 distinguished Portuguese authors (including Nobel laureate José Saramago), published by the Centro de Documentação 25 de Abril, University of Coimbra, Portugal. me tornas caule fardo cimento. roxos e libertos de maresia? que faremos maduramente em cachos? morrer é balizar o sol com perfume. das botas ao chafariz dos versos? – ilhas de carne e osso com a lava a escorrer? gritar é ter nas veias a raiva dos fortes? amar é sempre um medo que se canta. a nada nos obriga a posição dos mortos?